Regis Resources Limited (ASX: RRL) is a publicly listed Perth based gold production and exploration company with a proven management team that has a successful track record of developing mid- sized gold operations within Australia and Africa. 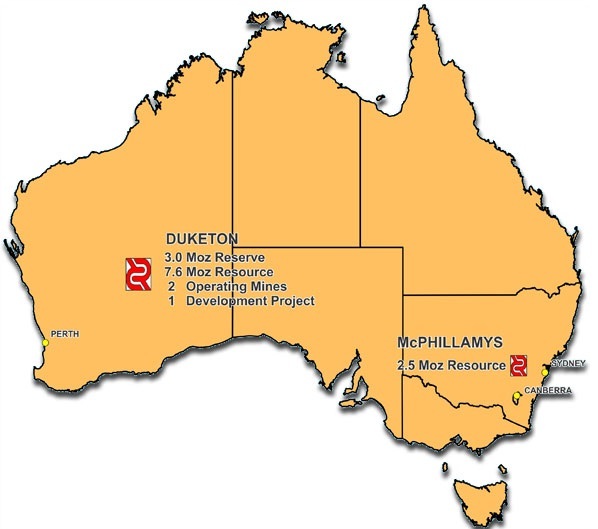 The 100% owned Duketon Gold Project located 130 kilometres north of Laverton in Western Australia commenced operations in August 2010 following the construction of the Moolart Well Gold Mine. The mine has a current remaining mine life of approximately 5 years at an average annual production rate of 100,000 ounces. The Company is confident that Moolart Well offers further Reserve and Resource growth potential from continued exploration programmes in the area. In August 2012 the Company announced the completion of construction at its second mine at the Duketon Project with the successful commissioning of the Garden Well Gold Mine. The project is expected to have a life of 9 years producing on average 180,000 ounces of gold per annum from current Reserves. The deposit remains open along strike and at depth with further drilling expected to increase the current reserve of 1.67 million ounces. The third deposit within the Duketon project area is the Rosemont Gold Project. Rosemont is located 9 kilometres north-west of the Garden Well Gold Mine. Construction of the Rosemont Project commenced in the March 2013 quarter and is expected to be completed by the September 2013 quarter. The Rosemont Project is being constructed as a hybrid project with a crushing and milling circuit located at the deposit and an ore slurry pumped to the Garden Well processing facility. It is expected that Rosemont will produce approximately 80,000 per annum over a 5 year mine life. The Company also possesses a number of satellite deposits surrounding both Moolart Well and Garden Well which contain quoted JORC Reserves and Resources including the Erlistoun gold deposit. In November 2012 the Company acquired the McPhillamys Gold Project from Newmont Exploration Pty Ltd and Alkane Resources Limited. The McPhillamys Gold Project is located approximately 35 kilometres south east of the town of Orange and 30 kilometres west of the town of Bathurst in the Central West region of New South Wales. The project has a quoted JORC compliant gold resource of 2.5 million ounces (57.4MT at 1.36g/t) and represents medium term development opportunity beyond the current growth projects at the Company’s Duketon operations in Western Australia. The immediate focus at McPhillamys will be a drilling programme to increase the density of drilling on the McPhillamys gold resource to a level that will allow estimation of an updated JORC compliant resource and ultimately a maiden reserve. The drilling will also focus on the very sparsely drilled near surface areas of the deposit. It is estimated that there is at least 12 months of work to complete this drilling and resource update. Contemporaneously with this drilling, Regis will commence studies and work aimed at satisfying the numerous technical requirements for completion of a definitive feasibility study in to the potential development of an open pit mining, CIL extraction project at McPhillamys. This work leading up to the commencement of a DFS is expected to take in the order of 24 months to complete. A DFS is likely to take a further 12 months to complete. Assuming that the DFS confirms a viable gold project at McPhillamys, Regis would then move to commence development of an operation.